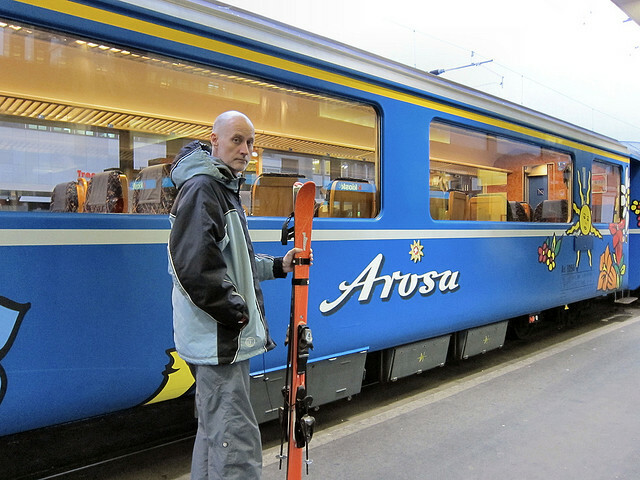 urrounded by the Alps, Chur makes a good base to explore the resorts in Graubünden. It is a cathedral city and capital of the canton with a beautiful medieval town centre and a history as a settlement going back several thousand years. 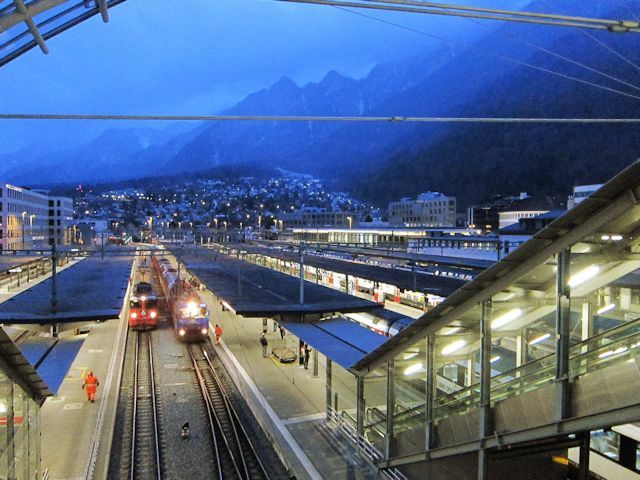 Apart from the excellent fast service from Zürich, the trains out of Chur are all operated by the Rhaetian Railways (Rhätischen Bahn) and run on some of the most spectacular train journeys in the world, including the UNESCO World Heritage route to the Engadine, and the Arosa service, the trains of which actually trundle quaintly through the streets of Chur. 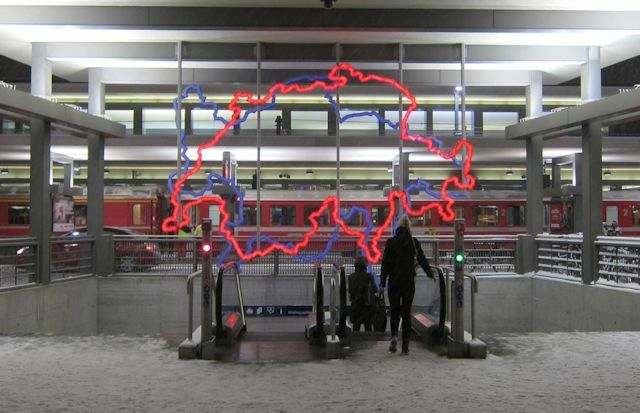 The main bus terminal is above the train station, and has direct services to a number of ski resorts such as Lenzerheide and Flims/Laax. Local buses operate from outside the station. 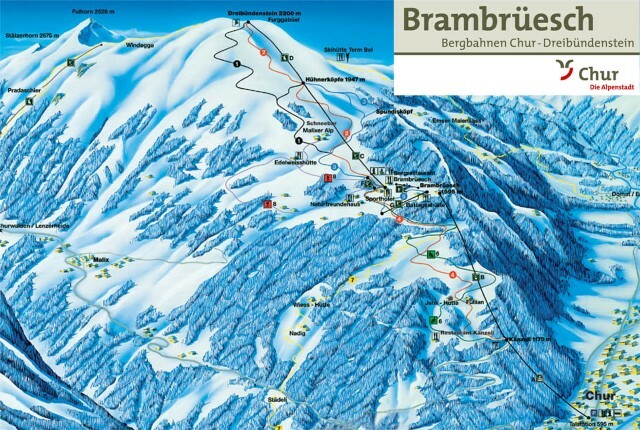 Although visitors might be tempted to travel to some of the world class resorts nearby, Chur itself has a small but respectable ski area, Chur Brambüesch, actually served by lifts from within the centre of the town. The run from Dreibündenstein down to the Känzeli cable car mid-station has over a 1000m vertical. For winter walkers, there is a spectacular walk from Brambrüesch all the way to Feldis. Chur has a good range of restaurants in the beautiful Old Town serving most cuisines, with the Drei Könige popular for traditional Swiss cuisine. A fairly lively nightlife mostly goes on around Welschdörfli. The best destination to access the downhill slopes by public transport in this ski area is Chur Brambüesch. The base station on Kasernenstr is 12 minutes walk from station or 3 minutes by bus - numerous bus services available, e.g. 7, 11, 13, 17, 19. From Zurich the least travel time is 1 hr 31 mins with as few as zero changes. From Basel the least travel time is 2 hrs 19 mins with as few as zero changes. The road distance from Zurich is around 118 km and the journey time is roughly 1 hr 15 mins. The road distance from Basel is around 203 km and the journey time is roughly 2 hrs 6 mins. The road distance from Berne is around 243 km and the journey time is roughly 2 hrs 31 mins. Destinations in the region include Feldis, Arosa, Flims and Lenzerheide. $$$$ Romantik Hotel Stern, Chur (3*) Rated a historic hotel by the Swiss Tourist Board. $$$$ ABC Swiss Quality Chur Hotel, Chur (4*) Centrally located and best rated hotel in Chur by TripAdvisor. $$ Hotel Drei Könige, Chur (3*) Friendly, centrally located hotel 10 minutes from Chur railway and bus stations .